To find a database on a specific subject or by name, go to Databases. Do you need help on finding data, go to Data Search Support. EndNote is a tool which allows you to collect and keep track of your references. EleUM is Maastricht University’s electronic learning environment. Overview of computer facilities such as Student desktop (anywhere), WiFi/mobile, printing. Sometimes the library cannot provide access to the publisher version of full-text journal articles. Or maybe, you can’t create a connection with the campus network. You can use one or more of the tools listed below to find alternative versions of the articles (like the author version). You can always request a copy directly from the author (if you can find the e-mail address); often not the fastest way, but traditionally a well-used route to get PDFs. Many researchers have joined one or more social networks for scientists. And many make their PDFs available inside these networks for download or offer the option to request it. ResearchGate, Academia and Mendeley are social networking sites for scientists and researchers to share papers, ask and answer questions, and find collaborators. Please keep in mind the copyright-rules of these networks. Unpaywall is a free web-browser extension for Chrome and Firefox that indexes papers from more than 5,000 repositories worldwide, including preprint servers and institutional databases. Get full-text of more than 10 million legal, Open Access articles while you browse. Open Access Button is a web bookmarklet that offers free legal research articles and data delivered instantly or automatically requested from authors. You can do this from the website, or install a browser extension. 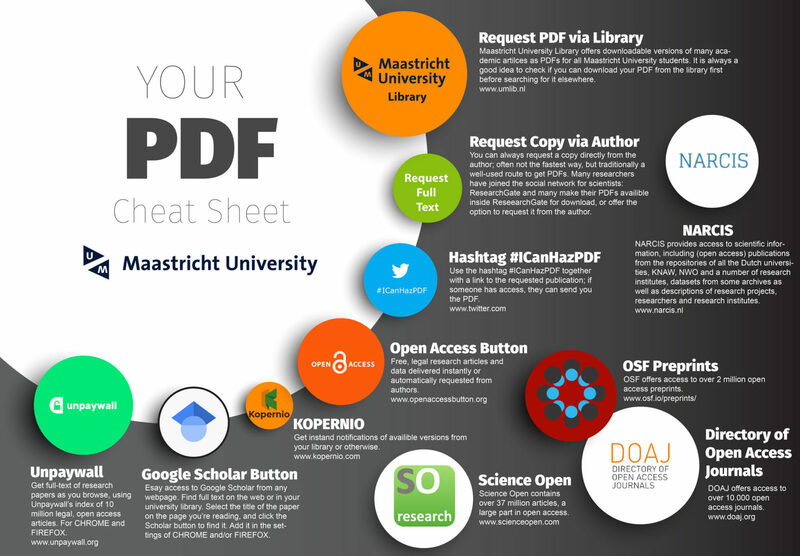 Kopernio is a browser plugin that finds the best available PDF of academic articles while you browse. Behind the scenes, Kopernio will search open databases and (where possible) your university’s subscriptions. BASE (Bielefeld Academic Search Engine) is a is a multi-disciplinary search engine to academic web resources, created by Bielefeld University Library in Bielefeld, Germany. BASE facilitates effective and targeted searches and retrieves high quality, academically relevant results. Other than search engines like Google or Bing BASE searches the deep web as well. The sources which are included in BASE are selected and reviewed. OAPEN is an initiative in Open Access publishing for peer reviewed academic books in the humanities and social sciences. With the Google Scholar button added to your browser, you get easy access to Google Scholar from any web page. Find full text on the web or in your university library. Select the title of the paper on the page you’re reading, and click the Scholar button to find it. You can request copies of articles via the UM Library Interlibrary loan service. Use the hashtag #icanhazpdf together with a link to the requested publication; if somebody has access, they can/will send you the PDF.